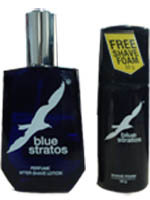 Click On Image Blue Stratos - Deodorant Body Spray - A body spray blended with the cool Blue Stratos fragrance. Feel fresh and confident all day with the cool, exhilarating sensation of Blue Stratos. Click On Image Blue Stratos - Shave Foam - A rich creamy lather with special moisturisers for a comfortable shave. Features the Blue Stratos fragrance. Click On Image Blue Stratos - Perfume After Shave Lotion - A fresh and invigorating splash that blends the cool, exhilarating Blue Stratos fragrance to refresh and enliven the skin after shaving. Click On Image Blue Stratos - Deo Talc - This talc is the finest cosmetic grade, French milled talcum powder, fragranced with the classic Blue Stratos scent.. It is velvety smooth and contains unique ingredients for extra absorbency and protection against perspiration wetness. Click Om Image Blue Stratos - Lather Shaving Cream - Blue Stratos shaving cream is amazing! with a rich creamy lather that gives you a smooth comfortable shave, that hydrates and protects your skin for the closest shave.